As per the statistics, Python has gained 3.62 percentage points year over year in Tiobe’s January 2019 index, beating Visual Basic .NET and Java. Today, we are discussing the most popular Python programming courses you can choose from. The Python® Programming Certification Training is suitable for both beginners, as well as experienced IT professionals who are willing to learn Python programming language. This will enable you to use the language for web programming, XML processing, game programming, rapid prototyping and more. Candidates are provided with real-time projects. This training will give an overview to the candidates, and varies from programming basics to functions and data structure. At Multisoft Systems, they give you 11 assessments, 20 hours long lab exercises and a training certificate on completion. Python is a multi-paradigm programming language. It supports object-oriented programming, structured programming, and functional programming patterns, among others. Python’s extensibility makes it inevitable to use for data analytics. With the help of Pandas, which is the software library, Python programming language is able to import data from excel spreadsheets to processing sets for time-series analysis. The Data Science with Python Training aims at guiding the candidates on how to install the Python environment, and other auxiliary tools and libraries. You will also learn to use SAS for data exploration and data optimization. 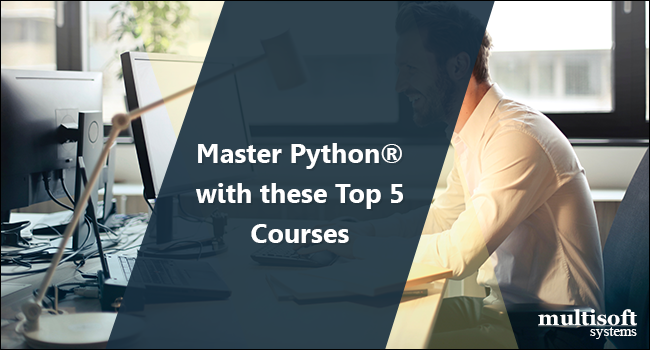 At Multisoft Systems, the course is divided in two parts; Mastering Python and using its packages and Mastering advanced analytics techniques. Both Python and R programming languages complement each other. In Data Science, R is used for statistical analysis and Python as a programming language. They are quite similar in syntax as both of them belong to the C-family languages. The Hands-On Python & R in Data Science Training will give you in-depth knowledge of data preprocessing and regression. Anyone who is seeking a career in Machine Learning should consider this training. It is aimed at individuals who wish to start their career in Data Science, or data analysts who wish to broaden their knowledge of Machine Learning. Natural Language Processing is developing the applications that understand human language, e.g., Google voice search. Natural language toolkit (NLTK), the most popular library for NLP, is written in Python. The Natural Language Processing with Python Training by Multisoft Systems offers hands-on experience on NLTK. The candidates are guided with the fundamentals of Sentiment Analysis and NLP Resource. It is for anyone who is keen to learn NLP using Python, as it is very easy to learn. Python is widely used to understand and analyze the data. Learning Python Data Analysis will give you knowledge of various mathematical toolkits like Numpy, Scipy and SciKit. The course video is perfect for Python developers who want to perform core data analysis tasks. You will learn advanced and recommend software engineering development practices, and data analytics techniques to obtain unseen data relationship. About the author: Nisha Negi is a Technical Content Writer at Multisoft Systems. She writes blog posts and articles on various technical subjects. She is an experienced IT professional and bears immense knowledge of the latest technology. She stays current with all the ongoing and upcoming certifications. Her way of expression is contemporary and crisp.